Google always transform the way by which people communicate with each other. By keeping this as a promise they launched two communication apps. One is called Allo, which tends to be a better messenger by including the features of Artificial Intelligence into the communication. 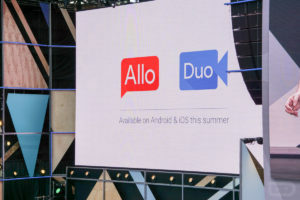 The other one is called Duo, which is a Video Calling application launched for both Android and iOS users. Allo is the innovative messaging app. It uses your contact number to find your friends who are using Allo just like WhatsApp. I would like enumerate the features of Allo. Google Allo tends to be more interactive with stickers, emoji, Whisper Shout and Ink. Whisper Shout helps you to express more by enlarging certain parts of the text. Smart Reply – It is an interesting feature that Allo has. This is the feature where Artificial Intelligence in Allo really works. Smart Reply learns the pattern of your replies to various messages and images. Then it will predict the replies for you. It will transform itself when you use it frequently by suggesting the replies. Google Now Assistant – Allo is integrated with the feature of Google Now assistant. This would help you have searches over Google in the midst of having conversation with your friend. This would help you to prove something especially when you are having certain debates with your friends or browse for updates of your favourite sports or to spot out good restaurants nearby and so on. Personal Assistant – Allo also holds a Personal Assistant which functions with the help of Artificial Intelligence. This could help you to find details regarding stock markets, updates on flight details or train details and so on. This could be your perfect assistant helping you with everything you want. Secured and Protected – Allo is well protected with end-to-end encryption supporting incognito mode. This ensures that your personal details as well as your chats are well-protected. So you don’t have to worry about your personal data and chats over Allo. Allo is quite different from Hangouts. Google also want to keep Allo and Hangout as two distinct products for the time being. Duo:Duo helps you to have better video calls with your friends. It supports almost all types of connections between Android as well as iOS platforms. Similar to Allo, Duo functions based on your contact number, so you can establish communication between those in your contacts list who already started using Allo. Duo also promises to have better video calling experience both on WiFi connections as well as on Data Connections. Knock-Knock – It is a new feature that allows the recipients to stream caller’s feed that too before answering the call. This is quite interesting. This feature will also help those people with feeble connections and also those who have the problem of frequent call drops. Video Quality – Duo guarantees a video of 720 pixels HD quality. The video quality also automatically adjusts with the quality of streaming.